BetterPriceChec is a plugin which can be installed on Chrome, Firefox and Internet Explorer browsers. However, malware researchers do not recommend installing or trusting the application at any point. The seemingly powerless extension actually is an advertisement-supported program which enables the connection to remote servers. In most cases this connection is used to present advertisements and send data collected by the associated tracking cookies. If you remove BetterPriceChec, the unauthorized connections will be terminated, and your virtual security will be less vulnerable. If BetterPriceChec is running on the PC, there is no doubt that the operating system is vulnerable. First of all, it is vulnerable because of the cookies installed to spy on you. There is no way to know for sure what kind of information this clandestine threat may collect. You ought to delete BetterPriceChec web cookies if you do not want to risk your private data being leaked. Even information concerning your IP address or operating system could be used against you, which is why the removal of these cookies is crucial. Malware researchers warn that you may need to delete cookies and files related to other malware as well. Since BetterPriceChec is usually distributed with the help of bundled downloads managed by InstallRex, Amonetize or Vittalia, there is a great possibility that additional malware has been installed alongside. If you do not catch and remove these applications from the operating system, they could cause even more harm than the advertisement-supported program itself. BetterPriceChec removal is complicated due to a few different things. First of all, the application is presented as a beneficial program which does not deserve to be deleted. Secondly, computer users do not realize that the advertisements associated to the application are presented by unreliable third-parties and that they may be employed as security backdoors. Clicking on these ads may expose you to malware installers and various scams. 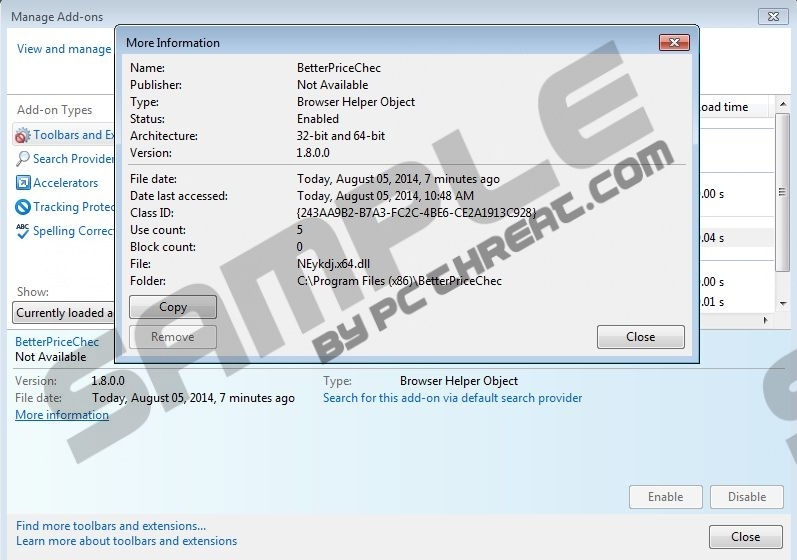 Finally, it may be difficult to delete BetterPriceChec because the infection changes its name. BeTTerPricceChEC, BeTtterPrIceeChheec and BettErPricEiChec are few of the many name variations which could be used to evade the removal initiated by authentic security software. If you install up-to-date, authentic malware removal software, you will not need to worry about the suspicious BetterPriceChec. This adware will be deleted automatically, and the additionally existing malware will be removed alongside. Even though manual removal is not recommended to computer users who lack in experience, more experienced users can use the instructions presented below. Right-click on the background of the Metro UI menu and select All apps. Now right-click the undesirable application and select Uninstall to complete its removal. Scroll down to the Taskbar and click the Windows button on the left. Click Control Panel to access a menu and then select Uninstall a program. Click Start on the Taskbar and select Control Panel. Double-click Add or Remove Programs and click Change or Remove Programs. Locate the unwanted application, click it and select Remove. Open the browser and simultaneously tap Alt+T to access the Tools menu. Select Manage Add-ons, move to the left and click Toolbars and Extensions. Click the undesirable extension, select Disable and then Close. Select Tools, click Extensions and identify the undesirable plugin. Click the trash icon on the right and select Remove. Simultaneously tap Ctrl+Shift+A to access the Add-ons Manager in a new tab. In the menu on the left click Extensions to locate BetterPriceChec. Click the Remove/Disable button on the left to get rid of it. Quick & tested solution for BetterPriceChec removal.